Toyota's sudden acceleration recall nightmare, which had people afraid they were going to die in exploding Prii, is basically over, but the lawsuits and court cases continue. The biggest chunk was supposed to be around $1.1 billion but, as Bloomberg reports, it's going to be closer to $1.63 billion when all is said and done. This lawsuit covers the loss of value that people think they've experienced because these Toyotas are getting a bad rap. The settlement includes $757 million in cash, including $227 million in attorneys’ fees and costs, and $875 million in non-monetary benefits, including free installation of a brake-override system for eligible vehicles, according to the plaintiff lawyers’ April 23 request for final approval. Hey, you know what would be great for Toyota? This recall thing never-ever-ever-ever happening again. In that vein, the AP says Toyota is opening up a training facility in Japan for mechanics that will simulate various issues so that they can sense what's wrong before it becomes a horrendous issue. For instance, Akio Toyoda said that new Prius braking was 0.06 seconds slower than the outgoing vehicle and consumers noticed but Toyota didn't at first. “When something happens next time, we will be faster with our response and then people can trust our vehicles more as safe,” Akio told reporters. Toyota has 120,000 mechanics worldwide. Per the AP, Toyota-centric today? Yeah, they're the ones making all the news so far. The Camry has been America's best-selling car for longer than there's been a Jalopnik, but they're losing market share to the Accord, Altima, and Fusion. What are they going to do about it? Follow Nissan's lead and CUT THAT PRICE. Toyota's average sales price for a Camry is about $21,000, down $1,400 from a year ago. Total discounts are now around $3,100 per-car according to Ward's Automotive. By comparison, the Accord sells for $2,600 more and is still gaining on the Camry. Don't feel too bad for them, they still hold 12.6% of the market to the Accord's 11.2%. They've also got it coming, given how boring the Camry is. How much will the BMW i3 cost you when it goes on sale? The battery plug-in will be a less-than-expected $41,350 before any incentives (or destination). Automotive News says this is so they can target second-car buyers in urban markets. We had a feeling this would be this cheap, although it's still pricy. 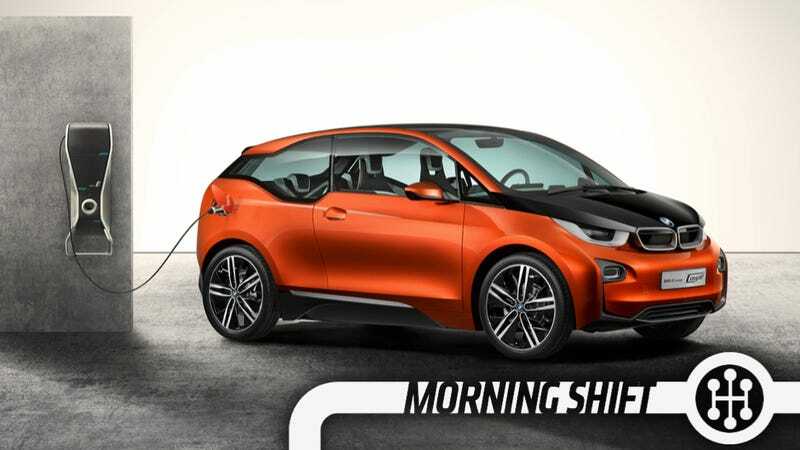 According to AN, BMW says the i3 is the world's first premium car designed from the ground up to be powered by an electric drive system. Unless they're hinting the Tesla Model S is actually a Mercedes CLS under the skin I don't really know what they're talking about. The smallish i3 can cover 124 miles in power-saving mode and, eventually, will be able to add a range-extending motorcycle engine. You'll be able to buy it sometime mid-year 2014 in the U.S. In what is a questionable and probably inevitable move for PSA Peugeot-Citroen, the French car company is in talks with Spain's Banco Santander to unload part or all of its consumer-credit unit according to The Wall Street Journal. Without getting too deep into the carmaker's weird tie-ups with the French government, the slump in the European car market hit no one harder than PSA and their bank is one of the few parts of the company making money. By hooking up with Santander, it's assumed the company can move away from part of its reliance on the French government and reorganize with a larger partner. Jettisoning consumer credit arms was something both Chrysler and GM did during the Carpocalypse, it's worth noting. On July 22, 2002, over the strenuous opposition of the United Auto Workers (UAW) and the auto industry, Governor Gray Davis of California signs a stringent law regulating emissions from automobiles. Despite his well-documented enthusiasm for the Hummer, a sport-utility-vehicle (SUV) known for its prodigious size (and prodigious emission of greenhouse gases), Davis' Republican successor, Governor Arnold Schwarzenegger, sought to uphold AB 1493 against continuous challenges from the auto industry and the presidential administration of George W. Bush. Democrat Barack Obama's election as president in 2008 turned the tide in California's favor: In January 2009, Obama directed the Environmental Protection Agency (EPA) to reverse an earlier decision and give California (by then joined by 13 other states) the right to adopt tougher auto emissions standards. That May, Obama announced plans to bring the entire nation up to California's proposed standard, which would make cars nationwide roughly 30 percent cleaner and more fuel-efficient by 2016. Neutral: Do You Think Less Of The Toyota Camry? Would you buy one at any price? Do you own one? Are people still confusing quality issues with bad drivers?